Radarbot is your ally on the road. It’s the only application that combines real-time Alerts with the best speed camera detection system using GPS. 100% legal and reliable. Drive safely and forget about fines forever. 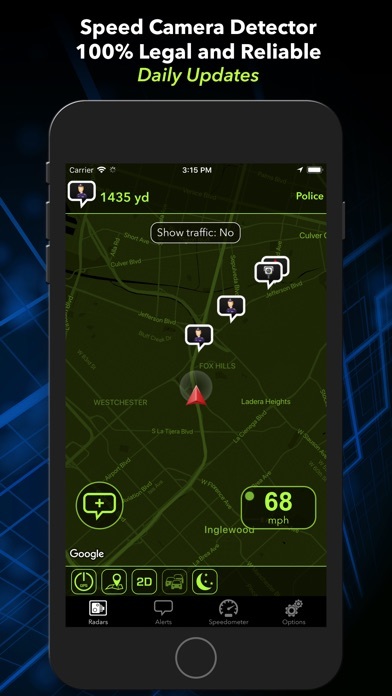 With Radarbot, you’ll have the best speed camera warning device, real-time traffic Alerts and an advanced speedometer, all in one powerful application. - SPEED CAMERA DETECTOR Have complete peace of mind at the wheel without risking your driving licence. Radarbot warns you about all kinds of speed cameras: -	Fixed speed cameras. -	Potential mobile cameras (reported by users). -	Tunnel cameras. -	ANPR cameras. -	Traffic light cameras. -	Dangerous traffic areas. Daily updates: We update our speed camera database every day so that you can benefit from continuous improvements and free updates. NO SUBSCRIPTION OR REGISTRATION REQUIRED! * FEATURES: - It can be integrated with any GPS navigator such as the Maps application, allowing you to simultaneously receive navigation Alerts. - Battery saving mode. The application is able to work in the background. You will continue to receive notifications even with the screen turned off. - Choose from 4 different visualization modes. - Simple and functional interface. You can see the distance to the nearest speed camera, it’s location, direction and speed limit all in real time. - Voice notifications. - Warnings for the direction in which you are travelling. The application automatically dismisses speed cameras in the opposite direction or outside your route. - Sound Alerts when approaching a speed camera. - Warnings when breaking the speed limit. - Vibrating mode for motorists. - Completely configurable warning distances and parameters. - Bluetooth connection. Select the audio output on the app and hear notifications from your hands-free device. - Verification of notifications. The reliability of speed camera notifications is calculated in real time, according to the information reported to the platform by all users. 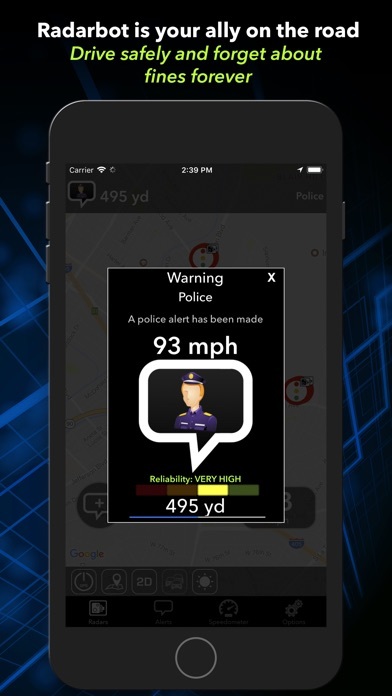 - REAL TIME ALERTS Radarbot is a community made up of 2 million drivers across the world, with whom you can share and receive voice notifications in real time. Find out instantly what’s happening on the road and avoid unwanted surprises. * FEATURES: - Communication platform created by and for drivers. 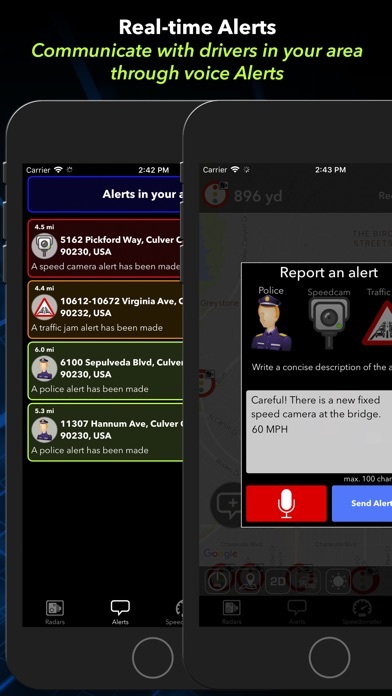 - Receive Alerts and notify about traffic, mobile controls and new fixed speed cameras. - Input through voice recognition: You can raise Alerts for other users without needing to use the keypad. (Requires iOS 10 or above.) 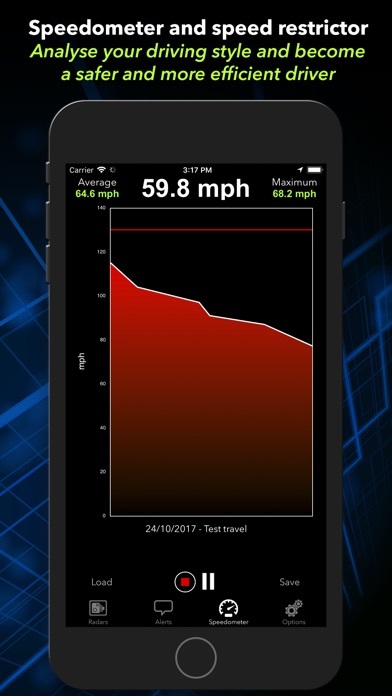 - SPEEDOMETER Log and visualize all speeds during your route. * FEATURES: - Real-time visualization of: * Speed diagram. * Current, maximum and average speed. - Allows you to establish a speed limit and to activate a sound Alert when you break it. - Route save function. - APPLE WATCH With the app for Apple Watch you will be able to see speed camera warnings and Alerts directly on your watch. Combine it with background mode to save battery on your phone. * Please note: Remember to follow these steps so that notifications reach your Apple Watch: - Make sure the "GPS Always Active" option is activated. - Ensure that notifications are enabled. - Turn off your iPhone’s screen. - Open Radarbot on your Apple Watch. 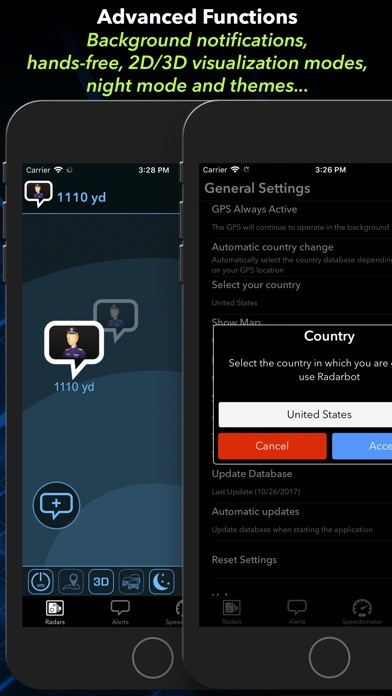 The PRO version of Radarbot includes everything as standard, free from advertising and in-app purchases. You can try the Free version of Radarbot and go PRO whenever you want, by making an in-app purchase. If you have any doubts or suggestions, we’d be delighted to help: [email protected] + Follow us on Facebook: https://www.facebook.com/radarbotvialsoft + Visit our website: www.radarbot.com * Continued use of GPS in the background may drastically reduce battery life.